Eric's day at school gets worse and worse as he refuses any help. Then Grandpa tells Eric that we should always be ready to ask for help - from family, friends, teachers - and especially from God himself. Instead of relying on themselves, children will learn to depend on God, who loves to answer the prayers of those who ask humbly and graciously for his help. Combined with stunning new artwork by Xavier Bonet, Eric says please will quickly become a firm favourite with young children. Can be read to children 3-5 years old, or by children 6-8 years old. Dai Hankey is also the author of The Hard Corps and A Man's Greatest Challenge. 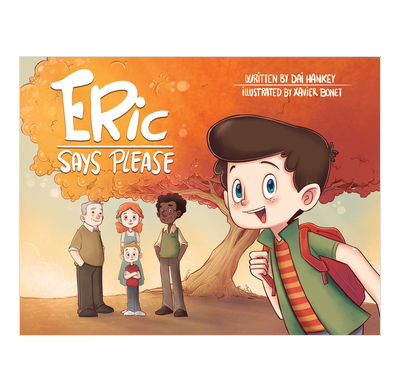 The message of "Eric Says Please" is easy to read aloud to little kids, yet challenging for us big kids to apply. Great book for teaching the kids (and their parents!) to depend on the Lord for help. With words you’ll enjoy reading aloud and pictures that will make you chuckle, Dai and Xavier teach us one of the most important lessons in life—we need help. A wonderful story about our need to rely on God, not ourselves, and the truth that He is always ready to hear our prayers even when we mess up.